If you are familiar with JQL Functions from JIRA Server then some of the concepts here are a little different. It is not possible in JIRA Cloud for an add-on to alter the results of a JQL search either during or after a search is being performed. ScriptRunner for JIRA Cloud augments each issue in your JIRA instance with some additional metadata and provides a number of JQL "aliases" that you can use within your JQL queries to access this metadata. This metadata is stored within your JIRA instance. The 'Issue Updated' field on your issues is NOT affected by the metadata that we store against each issue. See ScriptRunner Enhanced Search for more powerful search functionality provided by ScriptRunner for JIRA Cloud. The metadata that we store against each issue is automatically updated asynchronously whenever an issue is updated. This means that your search results may be out-of-date for a second or two after you edit an issue. 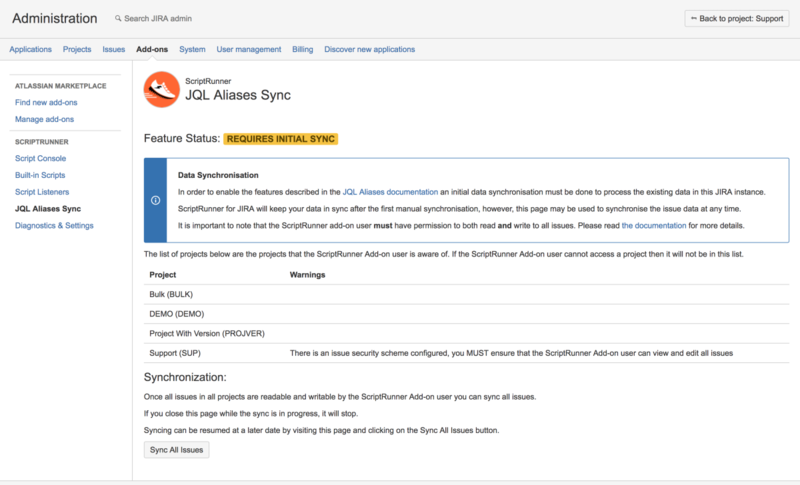 When ScriptRunner for JIRA Cloud is installed, or when you want to opt into this feature, an administrator must perform an initial synchronization. Although an administrator initiates the synchronization process, issues are accessed as the ScriptRunner Add-on user. If you close this page while the sync is in progress, it will stop. Syncing can be resumed at a later date by visiting this page and clicking on the Sync All Issues button. Search results for queries that use these aliases will be incorrect until an initial sync has been completed. As mentioned at the top of this page, it is not possible to integrate directly into the standard search functionality that JIRA Cloud provides. The ScriptRunner Enhanced Search functionality provides the ability to run advanced JQL functions in your JIRA filters in a similar way to ScriptRunner for JIRA Server. Each alias here has an explanation and an example. See the comparison table below for a direct comparison with ScriptRunner for JIRA Server. These JQL aliases will not work until an initial metadata synchronization has been performed. See the getting started section above. These JQL Aliases can be used in the Issue Search screen when searching in Advanced mode. Here’s an example of using the numberOfComments JQL Alias. This alias is used to retrieve issues that have a certain number of issue links. We can use numeric comparison operators like >, <, !=, <= and >= as well as =. This alias can be used to search for issues based on the type of issue links that they have. The link type is the name that describes the link, regardless of its direction e.g. Blocks, Cloners, Duplicates. The JQL operators != and not in also work with this alias. This alias can be used to search for issues that have links in a particular direction. This alias can be compared against a link name e.g. "is blocked by", "duplicates", "relates to"
type = Improvement AND hasLinks = "relates to"
This alias can be used to find issues that have a certain number of file attachments. This alias can be used with the numeric comparison operators. This alias can use the =, !=, in and not in operators. As you can see from the first example, we can use relative date functions that come built-in to JQL. We can also use the regular numeric comparison operators. In the same way as firstAttachmentDate, this alias can use the numeric comparison operators and the relative date JQL functions. This alias can be used to find issues that have a file attached by a particular user. You must use the username of the user you are interested in. reporter = currentUser() AND fileAttachedBy = "jbloggs"
This alias can also be compared using the !=, in and not in operators. The numberOfSubtasks alias can be used to search for issues with a certain number of subtasks. This alias can also use the numeric comparison operators. This alias can be used to find issues that have time logged against them that is restricted so it is only visible to other users in a specific project role. This alias can also use the !=, in and not in operators. The worklogVisibleGroup alias can be used to find issues that have time logged against them that is restricted so it is only visible to other users in a user group. The firstCommentedDate alias can be used to search for issues based on the date of the first comment. This alias can be used with the JQL relative date functions and also the numeric comparison operators. The lastCommentedDate alias can be used to search for issues based on the date of most recent comment. This alias can be used to find issues that had a comment made on them on a particular date. The commentVisibleRole alias is used to find issues that have comments on them that are restricted to only be visible to users within a particular project role. The commentVisibleGroup alias is used to find issues that have comments on them that are restricted to only be visible to members of a particular group. The table below contains equivalent JQL queries from ScriptRunner for JIRA Server and JIRA Cloud. Differences between the two systems are highlighted. hasLinks = "is blocked by"